Abstract: Transthyretin (TTR) binds amyloid-β (Aβ) and may reduce brain Aβ, a pathological feature in Alzheimer’s disease (AD). n-3 fatty acids (FA), docosahexaenoic (DHA), and eicosapentaenoic acid (EPA) may increase TTR transcription in rat hippocampus. We studied effects of n-3 FA supplementation on TTR-levels in patients with AD. Outpatients were randomized to receive 1.7 g DHA and 0.6 g EPA (n-3/n-3 group) or placebo (placebo/n-3 group) during 6 months. After 6 months, all patients received n-3 FA for another 6 months. TTR and FA were measured in plasma in all subjects, whereas TTR in cerebrospinal fluid (CSF) was measured in a subgroup. The study was completed by 89 patients in the n-3/n-3 group (75 y, 57% w) and 85 in the placebo/n-3 group (75 y, 46% w). Baseline plasma-TTR was within normal range in both groups. After 6 months, plasma-TTR decreased in the placebo/n-3 group (p<0.001 within and p<0.015 between the groups). No changes were observed in CSF TTR. From 6 to 12 months when both groups were supplemented, plasma-TTR increased significantly in both groups. Repeated measures ANOVA indicated an increase in TTR over time (p=0.04) in those receiving n-3 FA for 12 months. By linear regression analyses, n-3 FA treatment was independently associated with increased plasma-TTR at 6 months (β= -0.172, p=0.028). Thus, n-3 FA treatment appeared to increase plasma-TTR in patients with AD. Since TTR may influence Aβ deposition in the brain, the results warrant further exploration. Sandra Semar*, Markus Klotz*, Maryse Letiembre*, Chris Van Ginneken, Anne Braun, Viktor Jost, Michael Bischof, Wim J. Lammers, Yang Liu, Klaus Fassbender, Tony Wyss-Coray, Frank Kirchhoff, Karl-Herbert Schäfer (Handling Associate Editor: Diego Albani) *These authors contributed equally to this work. Abstract: In Alzheimer’s disease (AD), fatal neuronal cell loss occurs long before relevant evidence can lead to a reliable diagnosis. If characteristic pathological alterations take place in the enteric nervous system (ENS), it could be one of the most promising targets for an early diagnosis, using submucosal biopsies from the gut. We therefore investigated time- and spatial-dependent changes in an amyloid-β protein precursor (AβPP) overexpressing transgenic mouse model to examine early changes within the ENS. Wholemount preparations and paraffin sections were analyzed for the expression of neuronal, glial, and innate immunity markers. Isolated myenteric networks were screened for differences in overall protein expression, and a motility analysis delivered functional data. The level of AβPP in the gut was significantly higher in the AD mouse model than in wild-type mice and also higher in the gut than in the brain at all ages investigated. The transcriptional level of Nestin, GFAP, and TLR4 increased with age with a peak at 3 months. At the protein level, human amyloid-β was located in myenteric neurons. Myenteric networks showed a reduction of the neuronal density in AβPP compared to wild-type mice, which was functionally relevant as revealed by motility analysis. The ENS undergoes significant changes during the early onset of AβPP expression in AD mouse models that appear before those seen in the brain as demonstrated in this study. Thus, there is a chance of determining similar alterations in the human gut of AD patients, which could be used to develop early diagnostic approaches. Abstract: Abnormal modifications in tau such as hyperphosphorylation, oxidation, and glycation interfere with its interaction with microtubules leading to its dissociation and self-aggregation into neurofibrillary tangles, a hallmark of Alzheimer’s disease (AD). Previously we reported that an aqueous extract of cinnamon has the ability to inhibit tau aggregation in vitroand can even induce dissociation of tangles isolated from AD brain. In the present study, we carried out investigations with cinnamaldehyde (CA) and epicatechin (EC), two components of active cinnamon extract. We found that CA and the oxidized form of EC (ECox) inhibited tau aggregation in vitro and the activity was due to their interaction with the two cysteine residues in tau. Mass spectrometry of a synthetic peptide, SKCGS, representing the actual tau sequence, identified the thiol as reacting with CA and ECox. Use of a cysteine double mutant of tau showed the necessity of cysteine for aggregation inhibition by CA. The interaction of CA with tau cysteines was reversible and the presence of CA did not impair the biological function of tau in tubulin assembly in vitro. Further, these compounds protected tau from oxidation caused by the reactive oxygen species, H2O2, and prevented subsequent formation of high molecular weight species that are considered to stimulate tangle formation. Finally, we observed that EC can sequester highly reactive and toxic byproducts of oxidation such as acrolein. Our results suggest that small molecules that form a reversible interaction with cysteines have the potential to protect tau from abnormal modifications. 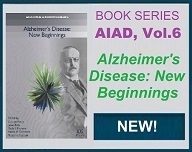 Abstract: Decreased semantic memory has been suggested as an early sign in Alzheimer’s disease (AD). This study aimed to investigate qualitative differences in semantic network between AD patients and healthy community-dwelling elderly controls. Category fluency test (animal) was administered to 416 AD patients and 339 controls. Mini-Mental State Examination was administered to evaluate global cognition. Patterns of semantic organization were compared between the two groups using hierarchical clustering (HC) and multidimensional scaling (MDS). In HC analysis, whereas a logically organized semantic structure was observed in the control group with an elaborate use of general knowledge, the semantic structure of the patient group was not interpretable. In MDS mapping, two dimensions of domesticity and size were identified in the control group. The MDS map of AD patients showed mixed features of perception and emotion. Knowledge-based semantic associations may be impaired in AD patients, which can add an extra dimension to cognitive impairments in AD patients regardless of quantitative facets of cognitive dysfunction. Abstract: Background: Differential diagnosis between frontotemporal dementia (FTD) and Alzheimer’s disease (AD) is often challenging. Autopsy series have identified AD pathology in a consistent percentage of patients clinically diagnosed with frontotemporal dementia (FTD). It has been demonstrated that the levels of tau and Aβ42 in cerebrospinal fluid (CSF) are a reliable marker for AD. Objective: To evaluate the presence of a CSF AD-like pattern in patients with FTD, and the related brain changes, to assess whether these patients had features resembling an AD pattern of hypoperfusion. Methods: Clinically-diagnosed non-monogenic FTD patients underwent an extensive neuropsychological assessment, 99mTc-ECD SPECT, and CSF analysis (tau and Aβ42 levels). FTD AD-like and FTD non-AD-like patterns were identified, and neuropsychological and neuroimaging features compared.Results: CSF AD-like pattern was reported in 9 cases out of 43 (21%). FTD AD-like and non-AD-like patients did not differ in demographic characteristics, cognitive deficits, or behavioral changes. Both groups had greater hypoperfusion in frontotemporal lobes as compared to age-matched controls. When FTD AD-like patients were compared to the FTD non-AD-like group, the former had greater hypoperfusion in brain areas typically affected by AD, namely precuneus, temporal, and parietal areas. Conclusions: CSF AD-like profile in FTD is associated with brain abnormalities typically found in classical AD, confirming the usefulness of CSF testing. Detecting an ongoing AD pathological process in FTD has several implications for defining distinctive treatment approaches, guiding genetic screening, and helping in patient selection in future clinical trials in both FTLD and AD therapeutics. Is Hippocampal Volume a Good Marker to Differentiate Alzheimer’s Disease from Frontotemporal Dementia? Abstract: Background: Previous studies analyzed the ability of hippocampal volumes (HV) to differentiate Alzheimer’s disease (AD) from frontotemporal dementia (FTD). However, these studies did not include patients selected according to clinico-biological criteria, using pathophysiological biomarkers. Objective: To analyze the effectiveness of hippocampal volumetric measures to distinguish AD from behavioral variant FTD (bvFTD), using strict inclusion criteria based on clinical and pathophysiological markers. Methods: Seventy-two participants were included: 31 AD patients with predominant and progressive episodic memory deficits associated with typical AD cerebrospinal fluid (CSF) profile and/or positive amyloid imaging (PET with 11C-labeled Pittsburgh Compound B [PiB]), 26 bvFTD patients diagnosed according to consensual clinical criteria and with no AD CSF profile, and 15 healthy controls without amyloid retention on PiB-PET exam. HV were segmented with an automated method and were normalized to total intracranial volume (nHV). Results: Significant reductions in HV were found in both AD and bvFTD patients compared with controls, but there were no significant difference between AD and bvFTD patients. Mean nHV distinguished normal controls from either AD or bvFTD with high sensitivity (80.6% and 76.9%, respectively) and specificity (93.3% for both), but it was inefficient in differentiating AD from bvFTD (9.7% specificity). There was no difference in the clinical and neuropsychological profiles according to HV in bvFTD and AD patients. Conclusions: When considered alone, measures of HV are not good markers to differentiate AD from bvFTD. Hippocampal sclerosis associated with FTD may explain the high degree of overlap in nHV between both groups. Jose L Molinuevo*, Juan Domingo Gispert*, Bruno Dubois, Michael Heneka, Alberto Lleo, Sebastiaan Engelborghs, Jesús Pujol, Leonardo Cruz de Souza, Daniel Alcolea, Frank Jessen, Marie Sarazin, Foudil Lamari, Mircea Balasa, Anna Antonell, Lorena Rami (Handling Associate Editor: Piotr Lewczuk) *These authors contributed equally to this manuscript. Abstract: Background: Cerebrospinal fluid (CSF) biomarkers of Alzheimer’s disease (AD) show an acceptable diagnostic sensitivity and specificity; however, their interpretation and ease of use is far from optimal. Objective: To study and validate the diagnostic accuracy of an easy-to-use normalized CSF biomarker index, the AD-CSF-index, in different European populations. Methods: A total of 342 subjects, 103 healthy controls and 239 AD patients, from four European memory clinics were included. The AD-CSF-index was constructed from the addition of normalized values between the minimum and maximum of amyloid and tau protein levels. The diagnostic accuracy, receiver operating characteristic, and regression analysis of the AD-CSF-index and other composite indices were evaluated in this study. Results: AD patients presented a significantly higher AD-CSF-index than healthy subjects (control = 0.5204; AD = 1.2272; p<0.001). The AD-CSF-index obtained a sensitivity of 88.6% at 85% specificity and also showed a significantly higher diagnostic power (p < 0.05) than the individual CSF biomarkers and other studied indices. The performance of the AD-CSF-index was very similar between ELISA and MesoScale measurements. Cut-off values of approximately 0.75 provided the lowest achievable overall classification errors and a cut-off point of about 0.95 consistently provided specificities above 85%. Conclusion: The AD-CSF-index represents a novel approach, combining normalized CSF values, for the biological diagnosis of AD. The AD-CSF-index presents an optimal AUC with high sensitivity and specificity and seems to be a simple and intuitive way to interpret AD CSF biomarker results even from different analytical platforms. Abstract: We studied the predictive value of cognitive performance, vascular risk factors, apolipoprotein E (APOE) genotype, and structural brain changes on MRI, on progression to dementia in post hoc analyses of 426 placebo patients (mean age 71 years; 55% women) with mild cognitive impairment (MCI) who participated in a previously published large multi-center clinical trial (Gal-Int-11). The ADAS-cog/MCI test, the New York University Paragraph Recall Test, and the Digit Symbol Coding Test were available at baseline, as were vascular risk factors and APOE genotype. Medial temporal lobe atrophy (MTA), white matter hyperintensities (WMH) and lacunes were assessed on MRI. Over two years of follow-up, 81 patients (19%) converted to dementia, while 345 patients (81%) remained stable. Results of Cox proportional-hazards regression analysis showed that higher age, worse cognitive test performance, presence of an APOE ε4 allele, and higher MTA scores on MRI increased the risk of progression to dementia in univariate analyses. Vascular risk factors, and WMH and lacunes on MRI, were not associated with progression to dementia. Lower performance on the ADAS-cog/MCI test (HR 1.08 per point increase; 95% CI 1.06-1.10) and Delayed recall test (HR 0.76 per point increase; 95% CI 0.68-0.85), as well as higher MTA scores on MRI (HR 1.33 per point increase; 95% CI 1.00-1.77) were independent predictors of progression to dementia in a step-wise Cox proportional-hazards model with age and gender forced into the model. We conclude that global cognitive function, episodic memory performance, and MTA on MRI independently predict progression to dementia in patients with MCI. Abstract: Background: Cognitive lifestyle may be an important modifiable risk factor for dementia but has not yet been comprehensively studied in healthy elderly. Objective: To examine gender- and lifespan-related differences in cognitive lifestyle in a population-based cohort. Methods: 872 individuals from the second wave of the Sydney Memory and Ageing Study (MAS) cohort were invited to complete the Lifetime of Experiences Questionnaire (LEQ), a validated measure of cognitive lifestyle. Of 555 questionnaires returned (64%), 253 were excluded due to prior diagnosis of mild cognitive impairment, leaving n=302 cognitively-intact elders (mean age 80.1 years, ±SD 4.7, 40.1% men). Results: Total LEQ was significantly higher in men (97.9 ±20.0) than women (90.0 ±24.5), resulting mainly from midlife LEQ differences. Men were more likely to have worked in managerial or professional jobs (73.8% versus 39.5% women), and twice as likely to have supervised large groups of workers. In late life, women were significantly more likely to be living alone (68.1% versus 25.4% men), but otherwise significantly more engaged in specific cognitive activities, including reading novels (72.3% versus 52.0% men) and incorporating volunteer work (31.9% versus 19.7% men) and socializing (59.0% versus 37.0% men) into their typical day. Over the adult lifespan, it was more common for men and women to transition between LEQ tertiles than remain the same. Conclusions: Cognitive lifestyle changes over the adult lifespan and exhibits a range of gender-based differences. While older women are more likely to be living alone they generally lead a more active current cognitive lifestyle. 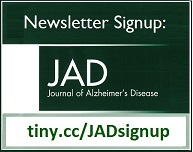 Abstract: Alzheimer’s disease (AD) is a neurodegenerative disorder characterized by a progressive deterioration of cognitive abilities, amyloid-β peptide (Aβ) accumulation, neurofibrillary tangle deposition, synaptic alterations, and oxidative injury. In AD patients, acetylcholinesterase (AChE) activity is low in most regions of the brain, but increased within and around amyloid plaques, where it accelerates the Aβ assembly into oligomers and fibrils, increasing its neurotoxicity. Tetrahydrohyperforin (THH), a semi-synthetic derivative of hyperforin, reduces tau phosphorylation and Aβ accumulation in AD mouse models. In the present study, we examined the effects of THH on Aβ-AChE complexes, α7-nicotinic acetylcholine receptors (α7-nAChR), 4-hydroxynonenal (4-HNE) adducts, caspase-3 activation, and spatial memory in young AβPPSwe/PSEN1ΔE9 (AβPP/PS1) transgenic mice, in order to evaluate its potential preventive effects on the development of the disease. We report here that treatment with THH prevents the association of AChE to different types of amyloid plaques; partially restores the brain distribution of AChE molecular forms; increases α7-nAChR levels in the hippocampus of treated mice; decreases the amount of these receptors in amyloid plaques; and reduces the oxidative damage, evidenced by 4-HNE adduct formation and caspase-3 activation on AβPP/PS1 mice brain; demonstrating the neuroprotective properties of THH. Finally, we found that the acute treatment of hippocampal neurons with THH, in the presence of Aβ-AChE complexes, prevents 4-HNE adduct formation and caspase-3 activation. Our data support a therapeutic potential of THH for the treatment of AD. Abstract: Several recent studies have indicated that white matter is affected in Alzheimer’s disease (AD). Diffusion tensor imaging is a tool by which the white matter microstructure can be examined in vivo, and might offer a possibility for the identification of the pattern of white matter disintegration in AD. In the current analysis, we made use of a novel model-free analysis approach of linked independent component analysis to identify a motif of diffusion parameter alterations exemplifying AD. Analysis of the diffusion data of 16 AD patients and 17 age-matched healthy subjects revealed six independent components, two of which demonstrated differences between the patients and controls. Component #0 was dominated by axial diffusivity, but significant alterations in fractional anisotropy and mean and radial diffusivity were also detected. Alterations were found in regions of crossing of major white matter pathways, such as forceps, corona radiate, and superior longitudinal fascicle, as well as medio-temporal white matter. These results lend support to the coexistence of white matter disintegration of the late myelinating associating fibers and wallerian degeneration-related disintegration, in accordance with the retrogenesis and wallerian degeneration hypothesis. Abstract: Apolipoprotein D (Apo D) is a lipid binding protein whose expression is strongly induced in the mammalian brain during aging and age-dependent neurodegenerative diseases such as Alzheimer’s disease (AD), where it can play an important function as a neuroprotective and antioxidant protein. Increasing evidence suggests that the gradual increase in free radicals and oxidative stress with age is the primary determinant to aging brain. The aim of this work is to study the effect of hydrogen peroxide (H2O2) in Apo D expression, in hippocampal cells, in order to investigate the relationship between oxidative stress and elevated levels of Apo D found in hippocampus during aging and AD and also elucidate the possible pathways that lead to this increase. In this study, we demonstrated that Apo D expression in hippocampal neurons of aged and AD brains directly correlates with age-related increase in oxidative stress. More importantly, our results in the HT22 cell line indicate that Apo D protein level increases in a concentration-dependent manner specifically at those H2O2 concentrations that caused oxidative damage and apoptotic cell death. These data support the idea that oxidative stress-induced apoptosis during aging and AD may be associated with the increment in the expression of Apo D in these situations. Abstract: Objective: Currently [18F]FDDNP is the only PET imaging probe with the ability to visualize hyperphosphorylated tau fibrillar aggregates in living subjects. In this work, we evaluate in vivo [18F]FDDNP labeling of brain neuropathology, primarily tau fibrillar aggregates, in patients with progressive supranuclear palsy (PSP), a human tauopathy usually lacking amyloid-β deposits. Methods: Fifteen patients with PSP received [18F]FDDNP PET scanning. [18F]FDDNP distribution volume ratios, in reference to cerebellar gray matter, were determined for cortical and subcortical areas and compared with those of patients with Parkinson’s disease with short disease duration, and age-matched control subjects without neurodegenerative disorders. Results: [18F]FDDNP binding was present in subcortical areas (e.g., striatum, thalamus, subthalamic region, midbrain, and cerebellar white matter) regardless of disease severity, with progressive subcortical and cortical involvement as disease severity increased. Brain patterns of [18F]FDDNP binding were entirely consistent with the known pathology distribution for PSP. High midbrain and subthalamic region [18F]FDDNP binding was distinctive for PSP subjects and separated them from controls and patients with Parkinson’s disease. Conclusions: These results provide evidence that [18F]FDDNP is a sensitive in vivoPET imaging probe to map and quantify the dynamic regional localization of tau fibrillar aggregates in PSP. Furthermore, [18F]FDDNP PET may provide a tool to detect changes in tau pathology distribution either associated with disease progression or as a treatment biomarker for future tau-specific therapies. Patterns of [18F]FDDNP binding may also be useful in diagnosis early in disease presentation when clinical distinction among neurodegenerative disorders is often difficult. Abstract: Background: In Alzheimer’s disease (AD), levels of N-acetylaspartate (NAA) is diminished and choline (Cho) and myo-inositol (mI) are increased. In cerebrospinal fluid (CSF), tau and phosphoylated tau (p-tau181P) is increased and amyloid-β(1-42) (Aβ42) decreased.Objectives: 1) To compare metabolites of different 1H-MRS voxels and assess its utility to differentiate AD from controls and to examine the relationship to cognition and to CSF markers. Methods: 17 healthy controls and 19 AD subjects were studied using 1H-MRS. In the AD cases, additional CSF analysis was obtained. Results: Relative to controls, AD subjects had reduced NAA/Creatine (Cr) levels in hippocampus (42.3% to 26.0%, p < 0.001), posterior cingulate gyrus (10.4% to 0.2%, p = 0.04), and parietal lobe (14.9% to 3.8%, p = 0.002). Further differences of Cho/Cr and mI/Cr in the hippocampus (Cho/Cr: p = 0.04; mI/Cr: p = 0.015) and posterior cingulate (Cho/Cr: p = 0.001; mI/Cr: p = 0.001) were observed. NAA/Cr of the hippocampus yielded the highest sensitivity (94.1%) and specificity (92.3%) to differentiate AD from controls. NAA/Cr was associated with general cognition (hippocampus: R = 0.68, p < 0.001; parietal lobe: R = 0.57, p = 0.001; posterior cingulate: R = 0.50, p = 0.003). Higher hippocampal NAA/Cr was related to higher CSF Aβ42, while lower parietal NAA/Cr was associated with a higher CSF total tau (t-tau) and p-tau181P. Posterior cingulate mI/Cr was related to CSF t-tau and NAA/mI. Conclusion: 1H-MRS is an appropriate measure in AD. Measurement at different regions presumably reflects different pathological changes. 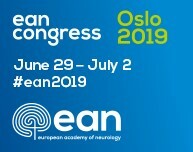 Abstract: PSEN1 mutations are the most frequent cause of familial Alzheimer’s disease and show nearly full penetrance. Here we studied alterations in brain function in a cohort of 19 PSEN1 mutation carriers: 8 symptomatic (SMC) and 11 asymptomatic (AMC). Asymptomatic carriers were, on average, 12 years younger than the predicted age of disease onset. Thirteen healthy subjects were used as a control group (CTR). Subjects underwent a 10-min resting-state functional magnetic resonance imaging (fMRI) scan and also performed a visual encoding task. The analysis of resting-state fMRI data revealed alterations in the default mode network, with increased frontal connectivity and reduced posterior connectivity in AMC and decreased frontal and increased posterior connectivity in SMC. During task-related fMRI, SMC showed reduced activity in regions of the left occipital and left prefrontal cortices, while both AMC and SMC showed increased activity in a region within the precuneus/posterior cingulate, all as compared to CTR. Our findings suggest that fMRI can detect evolving changes in brain mechanisms in PSEN1 mutation carriers and support the use of this technique as a biomarker in Alzheimer’s disease, even before the appearance of clinical symptoms. Abstract: Background: Aging and Alzheimer’s disease (AD) disrupt visuospatial processing and visual motion evoked potentials in a manner linked to navigational deficits. Objective: Our goal is to determine if aging and AD have distinct effects on visual cortical motion processing for navigation. Methods: We recorded visual motion event related potentials (ERPs) in young (YNC) and older normal controls (ONC), and early AD patients (EADs) who viewed rapidly changing optic flow stimuli that simulate naturalistic changes in heading direction, like those that occur when following a path of self-movement through the environment. After a random series of optic flow stimuli, a vertical motion stimulus was presented to verify sustained visual attention by demanding a rapid push-button response. Results: Optic flow evokes robust ERPs that are delayed in aging and diminished in AD. The interspersed vertical motion stimuli yielded shorter N200 latencies in EADs, matching those in ONCs, but the EADs’ N200 amplitudes remained small. Conclusions: Aging and AD have distinct effects on visual sensory processing: aging delays evoked response, whereas AD diminishes responsiveness. Abstract: The activity of protein phosptase-2A (PP2A) is significantly decreased in the brains of Alzheimer’s disease (AD) patients, but the upstream effectors for regulating PP2A activity are not fully understood. Nicotinamide mononucleotide adenylyltransferase 2 (Nmnat2) is a key enzyme involved in energy metabolism and its gene expression level is reduced in AD brain specimens. Whether Nmnat2 can activate PP2A deserves to be explored. Here, we first measured the level of Nmnat2, Tyr307-phosphorylation of PP2A, and tau phosphorylation in Tg2576 mice. We observed that the mRNA and protein levels of Nmnat2 were significantly decreased with a simultaneous elevation of p-Tyr307-PP2A and tau phosphorylation in Tg2576 mice. Further studies in HEK293 cells with stable expression of human tau441 (HEK293/tau) demonstrated that simultaneous inhibition of PP2A by okadaic acid abolished the Nmnat2-induced tau dephosphorylation. Moreover, we further demonstrated that overexpression of Nmnat2 could activate PP2A with attenuation of tau phosphorylation, whereas downregulation of Nmnat2 by shRNA inhibited PP2A with tau hyperphosphorylation at multiple AD-associated sites. Our data provide the first evidence that Nmnat2 affects tau phosphorylation by regulating PP2A activity, suggesting that Nmnat2 may serve as a potential target in arresting AD-like tau pathologies. 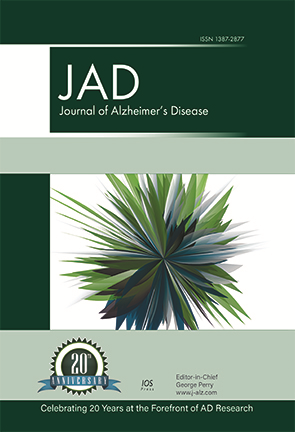 Abstract: Oxidative stress, hyperhomocysteinemia, altered DNA methylation, and insulin resistance in the brain are associated with Alzheimer’s disease (AD), but the role of amyloid-β (Aβ) in these events remains unclear. Intracellular cysteine is rate-limiting for synthesis of the antioxidant glutathione (GSH), and factors regulating cysteine uptake exert a powerful influence over cellular redox status, especially in mature neurons where cysteine synthesis via transsulfuration of homocysteine (HCY) is restricted. We investigated the effect of soluble Aβ oligomers (oAβ) on basal and insulin-like growth factor-1 (IGF-1)-induced cysteine uptake mediated by the excitatory amino acid transporter 3 (EAAT3) in cultured human neuronal cells. We also examined the effect of oAβ on intracellular thiol metabolite levels, DNA methylation, and the transcription status of redox and methylation-associated genes. oAβ inhibited EAAT3-mediated cysteine uptake, causing a decrease in intracellular cysteine and GSH levels. The ratio of the methyl donor S-adenosylmethionine to the methylation inhibitor S-adenosylhomocysteine was decreased, in association with an increase in HCY and a global decrease in DNA methylation, indicative of decreased activity of the redox-sensitive enzyme methionine synthase. These metabolic effects of oAβ coincided with changes in the expression of redox and methylation pathway genes. The ability of oAβ to modulate gene expression via their redox and methylation-dependent epigenetic effects may contribute to the pathology of AD and recognition of this mechanism may lead to novel treatment approaches. We describe a role of IGF-1 signaling in regulating redox and methylation homeostasis, and propose this to be a pathogenic target of oAβ. 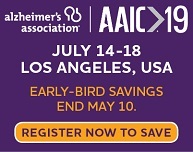 Abstract: Validation of cost-effective, non-invasive methods to identify early (pre-clinical) Alzheimer’s disease (AD) is increasingly becoming a key research challenge. We have developed two ELISA sandwich colorimetric tests for the accurate detection of amyloid-β (Aβ)1-40 and Aβ1-42: i) directly accessible (DA) in the plasma, ii) recovered from the plasma sample (RP) after diluting the plasma sample in a formulated buffer, and iii) associated with the remaining cellular pellet (CP). These tests were carried out on samples from healthy controls (n = 19) and individuals with mild cognitive impairment (MCI; n = 27) with amnestic-hippocampal syndrome to investigate whether this comprehensive approach may help to explain the association between blood Aβ levels and MCI. A logistic regression analysis detected seven direct or calculated markers (CP 40, DA 42, RP 42, DA/CP 40, DA/RP 42, DA/CP 42, and DA 42/40) with significant odds ratios (OR) after they were dichotomized with regard to the median of the pooled population. In particular, the likelihood [OR (95% CI)] of having MCI for patients with catCP 40, catDA/RP 42, catDA/CP 42, or catDA 42/40 below the corresponding population median (“positive test”) was 11.48 (1.87-70.52), 22.09 (3.19-152.61), 11.48 (1.87-70.50), and 9.54 (1.77-51.38)-fold higher, respectively, than in those with a “negative test” after adjusting for the effect of the ApoE genotype. These results are congruent with the hypothesis that changes in blood Aβ levels may be associated with the initial stages of AD. Thus, these Aβ blood biomarkers might be useful tools for screening for those at increased risk of developing AD.